Kawasaki FH580V Series Engine Special! 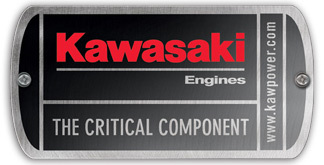 We are having special low pricing on all Kawasaki FH580V replacement engines and Free Fed-Ex Ground Shipping. Due to this engine being non EPA compliant, limited quantities available. All new Kawasaki FH580V Series Engines are Covered by a 3-Year Warranty, one of the strongest in the industry. It is one more reason to insist on Kawasaki Power in the Equipment you count on. After 5% discount at Checkout. Residential Delivery: Our free freight shipping is for commercial addresses only (please use business name as shipping location at checkout). Any engine that needs to be delivered to a residential address please order our item # "RESDELIVERY". Please note that if you place an order online and have it shipped to a residential address and do not purchase the Residential Delivery Option, you will be notified by phone with options and this may delay your order up to 3 days. Commercial address has to be a actual commercial location and not a business ran out of a house. Farms and any location with restricted Access, Schools, Hospitals, Penitentiaries, etc. are not considered a Commercial Location and you must purchase the "RESDELIVERY". Lift Gate: If a lift gate is needed please order our item # "LIFTGATE". If you decide on delivery to use the LIFTGATE and did not pay for it, an additional $40 charge will be added to your Bill. Freight Damage: If you see any damage on a Freight Shipment, please note it on the Bill of Lading with the Driver before signing. Once the Bill of Lading is Signed any damage that is not noted is now the responsibility of the Buyer and we can no longer go back after the Freight Company.